I don’t know why I keep watching this series. Even though I have a feeling that it’s going to be disappointing, I still feel some sort of excitement whenever they release a sequel. I guess it has something to do with human nature and violence. Everything about this film is recycled. People claim that each sequel adds to the storyline because it provides information that the audiences did not have prior to a specific installment. I cannot disagree more. I think the writers have dug themselves so deep into the “mythology” of the series to the point where there’s five plotholes to each so-called twist. Each sequel then tries to solve those plotholes by trying to tell a story and providing more twists to keep the viewers engaged. It’s an interminable cycle that I think will not end any time soon as long as people are actually willing to pay for a ticket in the cinema. 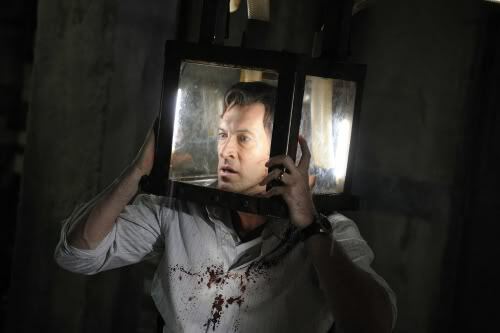 Even though I did enjoy this sequel more than “Saw IV” because it’s more comprehensible, we get too many flashbacks (it’s literally more than half of the film) that practically say, “Look over here! You missed this! Aren’t we brilliant and you’re not because you didn’t figure it out before?” It’s an insult but a laughable one so it becomes somewhat harmless. What worked for me was the rivalry between Costas Mandylor and Scott Patterson. I’ve been wanting these two to collide ever since the first few sequels. (I actually do not remember when each of the character appeared because all of them have the same “story.” Only the torture scenes are different.) Here, they get to battle it out a bit. Another actor that worked for me was Julie Benz even though I strongly believe that they could’ve used her more. She’s a strong actress (I’m still a big fan for her role in of “Buffy the Vampire Slayer,” “Angel,” and “Dexter”) and it shows in pretty much each scene she was in. What didn’t work for me was the return of Tobin Bell as Jigsaw. No, that is not a spoiler and you will see why. He talks in the same pitch and tone in pretty much every line and I can fall asleep listening to him. If they are going to make a “Saw VI” (which I bet they will), I want to see less of him. As for the infamous traps, I only have one favorite which has got to be the opening scene involving a pendulum. I also liked the part where Benz finally figured out what they were supposed to do right from the beginning. I cannot recommend this picture because everything is like a rerun of the first four movies.